Sometimes, “Do-It-Yourself Recruiting” Just Isn’t Enough. When your CIO goes MIA, your wireless solution team wears out, or you need a top-notch project manager to lead a transformation, you don’t have time to waste. 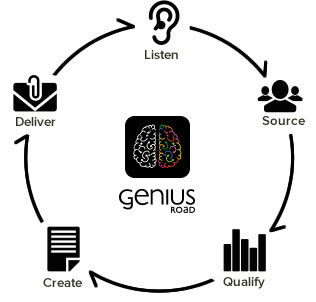 Call Genius Road. We Listen. We specialize in finding, qualifying and presenting superior candidates for our customers’ open positions. Painlessly. Our process starts with listening. We spend time with you upfront to fully understand the job you want to fill, as well as get a real feel for your company’s culture and persona. Then, we cull through our extensive network to identify the best match for your open positions. For us, it’s not a numbers game. Instead of forwarding you every candidate with potential, we qualify them for you. In addition to sending you resumes of well-vetted candidates with staying power, we also create detailed summaries that highlight their soft skills. Saving you time. Pure Genius. You can’t afford to hire someone who looks great on paper, only to discover, four months later, that he or she doesn’t mesh with your leadership team or the way you do business. You may have a solid network, but it may not be extensive enough to meet your company’s changing needs. More importantly, do you really have time to add the scavenger hunt of high-level or tech-specific recruiting to your ever-expanding to-do list? You save time, frustration and put together a darn good team in the process. How smart is that? Genius…Pure Genius.